Summary: The Silverstein family is coming together in Great Neck, Long Island, for the nuptials of the youngest daughter. Always considered the favorite—and the object of much envy and resentment—Angelica has planned a fairy tale wedding to her fiancé, a former fighter pilot. But there are storm clouds on the horizon. Gretchen, Angelica’s sister, is dealing with a failed marriage and her moody teenage daughter Justine. One brother is a callous businessman while the other is struggling with his search for love and a career. Her mother is in a battle of wills with the wedding planner, while her father, a recovering alcoholic, struggles to confront his ex-wife’s lavish new life in the Long Island manor of her dreams. And her grandmother Lenore has decided it’s high time to take charge and set her grandchildren on their proper paths. 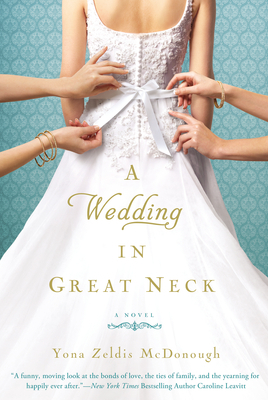 Yesterday, I reviewed a very fun book about a crazy family called A WEDDING IN GREAT NECK by Yona Zeldis McDonough. And then earlier today, I posted a great guest essay by Ms. McDonough about her fondness for book clubs. Well, now I have an opportunity for you to win your very own copy of A WEDDING IN GREAT NECK courtesy of Saima Agency. To enter, just fill out the form below before Thursday, October 11th at 11:59 p.m. ET. I will randomly select and notify the winner the following day. This contest is open to those of you with US addresses only. Good luck! Great review - sounds like a winner!